This slow and easy ride up to the waterfall is perfect for first-time riders, families, or people who really want to soak in the surrounding natural beauty. 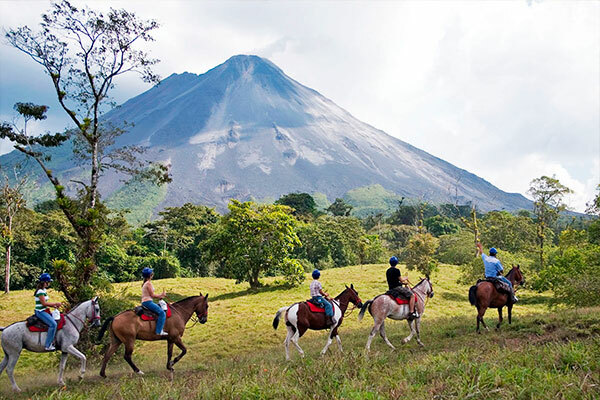 During your 1-hour trail ride through the rainforest your guide will point out wildlife, and you will get to see beautiful views of the lush countryside and the breathtaking Arenal Volcano. When you reach the entrance to the waterfall, you will “park” your horse at a rustic ranch and head with your guide down to the La Fortuna Waterfall. There are over 300 steps to get to the base of the La Fortuna Waterfall along a private trail. On the last part of the hike you will have to go over a few slippery rocks, but the trek is worth it! When you reach the bottom, you’ll have an opportunity to take lots of pictures and swim in the cool waters of one of the largest waterfalls in Arenal. PLEASE NOTE: The walk down to the La Fortuna waterfall is not recommended for older people with hip, ankle or knee problems as the path is rather rocky and slippery. The Dos Pinos waterfall can be viewed from the upper platform where clients dismount their horses without having traverse the difficult path. What to Bring: Comfortable clothing, comfortable trekking shoes.